← 52 Weeks, 52 Runs. No. 11: Gimme five! This week’s run was a cautionary tale. 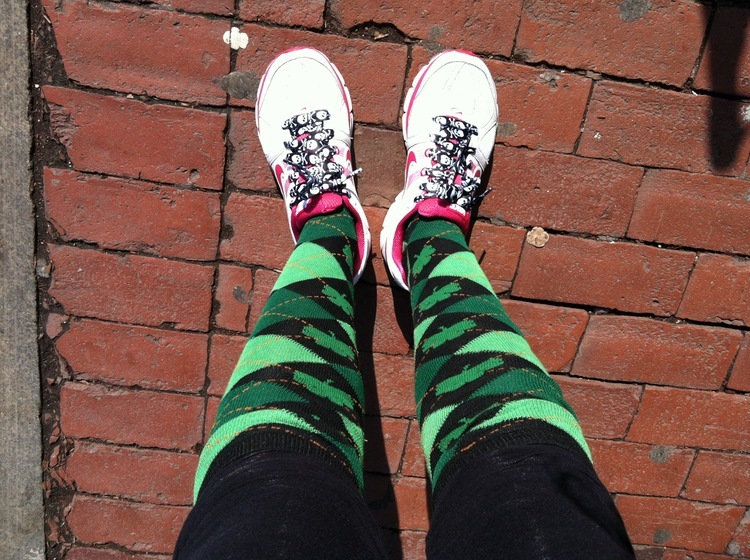 When it’s March in Boston but it feels like March in Sydney, do not wear tights. I repeat: Do not wear tights. 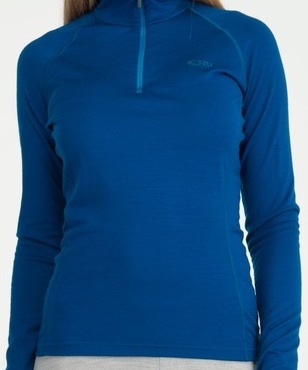 You may at first think you’re terribly clever for eschewing your super-duper heavy winter tights in favor of lighter-weight poly/cotton gym leggings. But this superior feeling will be fleeting. You see, leggings are still tights. And tights + running + ridiculous March weather = TOO HOT. I'm not sure green is my color. All jokes aside (never! 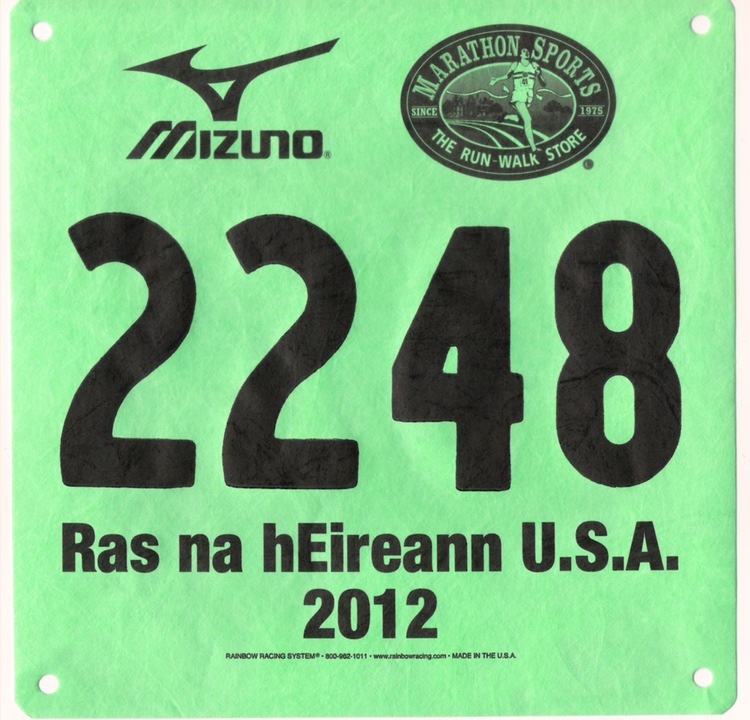 ), this weekend’s 5K, the Ras na hEireann U.S.A. (“race of Ireland and the United States”) in Boston, marked No. 12 in my 52 Weeks, 52 Runs challenge. That’s right, 12! And despite my poor sartorial judgement, it was a glorious occasion. Blue skies, green duds, and the promise of many, many ales. I don’t have a drop of Irish blood in me (although lately I’ve been making up for that with beer), but I thought I should show some spirit. 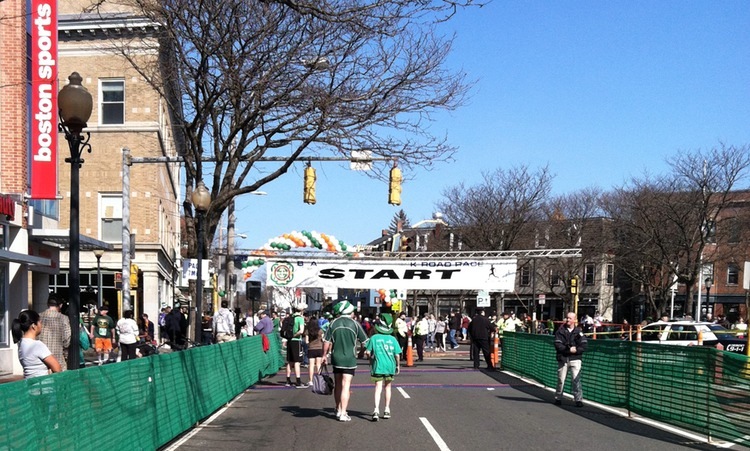 My spirit-delivery mechanism was long socks, a common choice for runners at St Patrick’s-themed events. But, alas, long socks have many tights-like properties, so on this occasion, they quickly became socks of the ankle persuasion. Oh well, I tried. They had their fleeting moment in the sun. Needless to say, my running performance was hampered somewhat by the overzealous dressing. I would have taken off my long-sleeved shirt, but the universe is definitely not ready for me to run in a sports bra and nothing else on top. I found it strange that I was struggling over 5K when I had run farther than that in the two previous races, and with a decent showing in both. But then the sweat ran into my sneakers and I remembered. Tights. This hill made me look more deranged than usual, which of course is why I chose to share the evidence. (I am also clearly walking.) Photo by Jim Rhoades. It's not his fault. What I didn’t have getting me across the line was Hubby. While I was sweating and cursing on my 5K, he was finishing the Quincy Half Marathon in fine style (definitely sweating; cursing, not so much). Puts me to shame every time. Savvy readers will recall that a medal has little place in my world unless it doubles as something useful (usually booze related), or is from the recent Wild Rover series (whose three-in-one medal was unparalleled in its splendor). 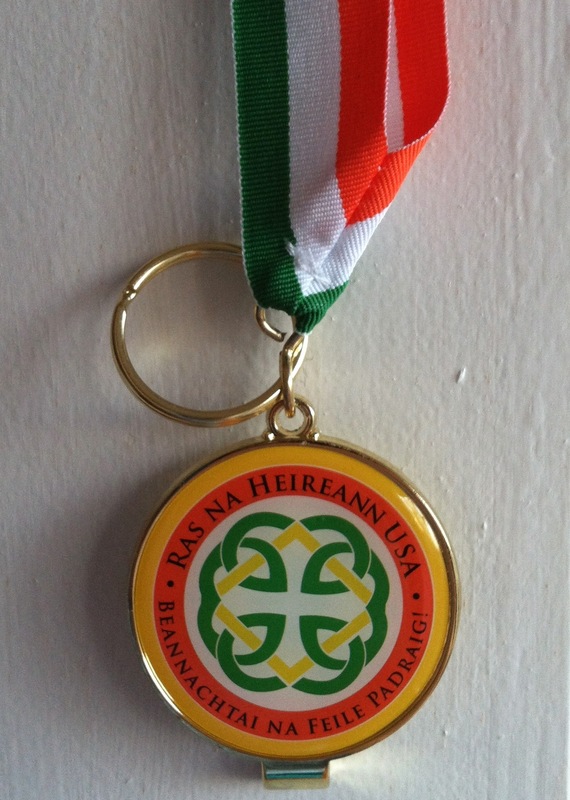 The Ras na hEireann produced a shiny souvenir that moonlights as a bottle opener and a keyring. Also, it was pretty. So I was happy. In a shocking turn of events, I didn’t partake in ale. There were many pubs along the route serving beer to thirsty, sweaty folk après-run, but I was solo and the thought of imbibing alone with a face as hot as the sun was not appealing. So I took my burning face on to the brightly lit subway instead, which was a much better idea. Twelve runs down, 40 to go. It’s a long, salty road ahead. My apologies for the premature publication last night. I was clearly as overzealous with the Publish button as I was with this week’s outfit. I think it’s also known as Blogging While Tired. In any case, forgive me. 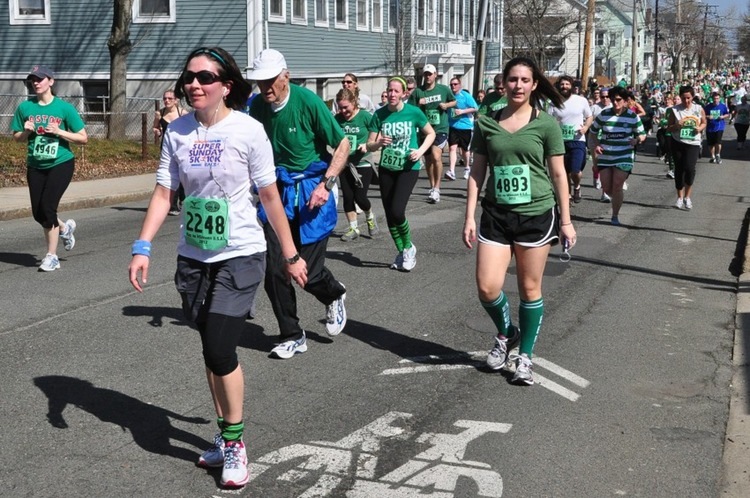 This entry was posted in 52 Weeks, 52 Runs, Fitness, Humor, Running and tagged 5K, Boston, road race, running uphill. Bookmark the permalink. I live right by there! I was going to do that race, but then decided I would be too hungover to run. I was right. Congrats on your finish though! Thanks! Probably a wise decision on your part. I haven’t done a run fully hungover yet, but I can imagine that would be about the worst feeling in the world. Also, greasy food and running really don’t mix! I accidentally wore green on St. Pat’s. I hate when that happens. I have no spirit. For what it’s worth, you now run slightly faster than I do, and I’ve been at it for a lot longer. But I maintain that you are lighter and therefore have less mass to propel. I can’t run that fast on a treadmill, so you have me there. Time to take it to the streets? 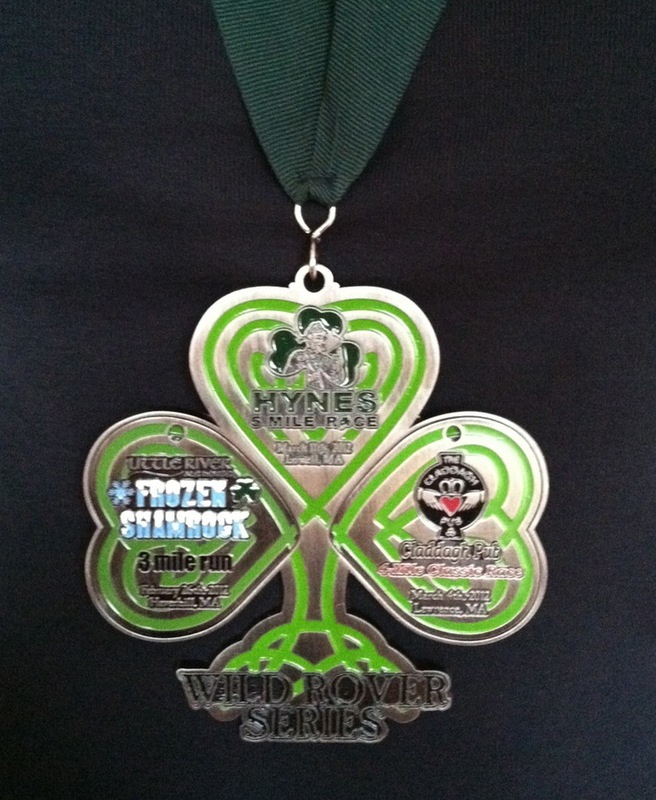 Why can’t more medals be like that medal?! Well done on number 12!! Keep up that momentum!! LOL! BWT is always forgiven.